Szoke and Welsh look forward to high speed Mosport. TORONTO, Ont. - Brantford, Ont. 's Jordan Szoke is perfectly poised to regain command of the Parts Canada Superbike Championship as the series visits Mosport International Raceway in Bowmanville, Ont. for its key midseason doubleheader. 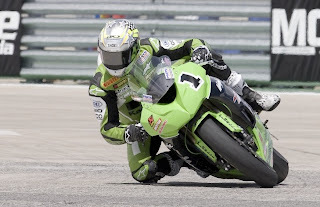 Although the five-time Canadian Superbike champion comes into the fourth and fifth rounds of the seven-race 2009 season 11 points out of the series lead he should enjoy a distinct advantage on the 3.9km (2.459-mile) circuit. Szoke has five career victories at Mosport, more than any other active racer in the series, and he swept the doubleheader at the track in 2006. "It's definitely a special weekend," says the 30-year-old. "Between the track and the fans it's definitely a favorite of mine. It's a great place to go racing." Szoke expects the high speed nature of the fast and flowing 10-turn track to suit the Ninja ZX-10R Superbike. "I believe we'll have the best overall package this weekend and with the power of our bike being so strong it'll be very tough for the others to stay with us up backstraight." Szoke also thinks he is well-positioned to add to his nine-point lead in the Yoshimura Pro Sport Bike division on the Kawasaki Ninja ZX-6R, on which he has won two of the first three races of the season. "I think that bike is just so much better than anything else in the class," says Szoke, who is trying for a fourth straight title in the Sport Bike category. "It just gives me confidence in every situation and I'm totally comfortable on it." Szoke's Canadian Kawasaki Motors factory team-mate Alex Welsh is also looking forward to Mosport, which is a home race for the Uxbridge, Ont. racer. "I think Mosport suits my style," says the 21-year-old, who was last year's HJC Pro Rookie of the Year Award winner on the national tour. "It's not bumpy, there are a lot of elevation changes and a lot of speed. I think I'll have some family and friends come out, and that will be nice." Welsh comes to the halfway point of the Superbike season sixth in points but feels he has learned a lot about his Ninja ZX-10R through the first three races of the year. "The Superbike is living up to what I expected," he says. "It's got a lot of power and it can be a real beast but I'm learning to tame it." Welsh is fourth in Pro Sport Bike points after scoring a career high third place finish at Race City Motorsport Park in Calgary on his Ninja ZX-6R. "The first two races of the season I expected to be closer but in Calgary things really came together for me," he says. As an added bonus this weekend Szoke and Welsh will debut special bodywork on their Ninja ZX-10R Superbikes to commemorate the 25th anniversary of the launch of the Ninja brand by Kawasaki. The two bikes will feature special 25th anniversary graphics along with each rider's own personal touches - in Szoke's case a dragon and a "Las Vegas Lucky 7" theme for Welsh. The bodywork is being airbrushed by BK Designs of Ottawa and after the season it will be auctioned off with proceeds going to the "Get Well Trev" Fund for injured Canadian moto journalist Andrew Trevitt and the Canadian Rider Safety Fund. Practice for this weekend's doubleheader at Mosport opens on Thursday, July 16 and qualifying for both the Parts Canada Superbike and Yoshimura Pro Sport Bike categories will be held Friday, July 17. The first 14-lap Pro Sport Bike race goes green at 1:00 p.m. on Saturday, July 18 with the second race scheduled for 12:45 p.m. on Sunday, July 19. The 20-lap Superbike races are on tap for 3:00 p.m. on Saturday and 3:15 p.m. on Sunday.